Serena Williams will meet the woman she is about to depose as world number one when she takes on Victoria Azarenka in the final of the Qatar Open on Sunday. Williams beat third seed Maria Sharapova 6-3 6-2 in the second semi-final, after Azarenka saw off fourth seed Agnieszka Radwanska 6-3 6-3. Second seed Williams had guaranteed she will take the top ranking next week just by making the last four. Her victory over Sharapova was the American's 60th in 63 matches. "Conditions were a little tough," said Williams, 31. "Maria's always playing really well and she's just so consistent, so I'm trying to be consistent as well." "She's a legend in tennis. I don't know where I'm going to be at 31. It's definitely an incredible achievement." Williams needed just 73 minutes to secure her 10th successive win over Sharapova as the Russian struggled to cope with the 15-time Grand Slam champion. 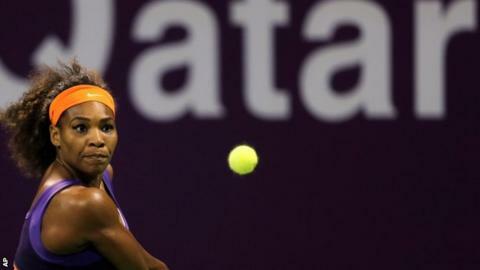 "I love it here in Doha," said Williams. "I've never played this particular tournament but I've played in Doha before and had some good results, and I hope to have a good result in the final tomorrow, too." Defending champion Azarenka has a 1-11 record against Williams and has lost their last eight matches, but she heads into the final as the only unbeaten player on the WTA Tour in 2013. "I just have to be consistent and really focused on my own game," she said. "We all know she has a great serve. "She's really aggressive and really consistent, so for me it's important to just focus on myself and execute my game. That's it." Asked about Williams taking her number one spot, and becoming the oldest woman ever to top the rankings, Azarenka said: "She's a legend in tennis. I don't know where I'm going to be at 31. It's definitely an incredible achievement." The Belarusian, 23, retained her Australian Open title last month and had too much for Radwanska in Saturday's first semi-final. She has made a strong start to the season for the second year in a row, and explained: "I've grown up a little bit. It's maturity and a little more experience. The beginning of last year was a kick start for me to find more rhythm and step up my game. "I also love it here in Doha and it feels like home, so I am glad I am in the final again."